I was lucky to get a preview of the new Brewdog bar on Friar Lane, Leicester last night – their 27th bar, opening just after the Barcelona branch. What’s good enough for Lionel Messi is clearly good enough for Esteban Cambiasso. I was really impressed. The bar is nice enough, but the main thing is great beer and great staff who were totally convincing in their interest in the product and their passion to sell it. 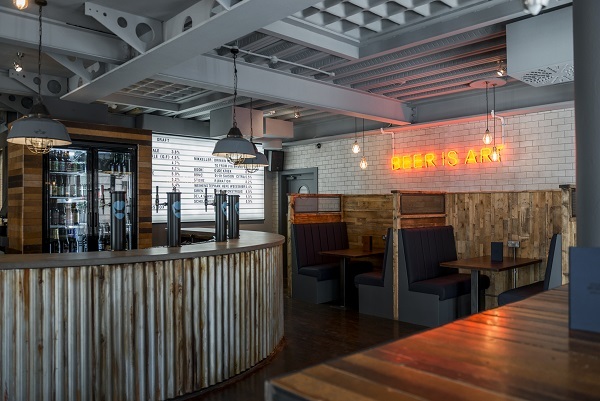 They have 20 beers on draft, some from their own brewery near Aberdeen and others from a range of small and microbreweries, including those where Brewdog has made investments themselves. We tried a fair few, starting with Brewdog’s very hoppy pale ale Vagabond which being gluten free is going to please a lot of people. The Boon Oude Kriek was a sensational sour cherry beer, much less sweet and more complex than most bottled versions I’ve had. The 5 A.M. Red Ale was very drinkable and only the Zeitgeist black lager – combining treacly stout flavours with the freshness of a lager – wasn’t really to my taste. You will see from the graphic above that the beers are strong and expensive. I know there are people out there who will bemoan the craft beer scene as a fad to fleece the foolish and that you can get good beer much more cheaply at a ‘Spoons. I won’t rehearse all the arguments but I would say you’re getting reliably good product here and all those who want to drink different beer in a different setting are welcome to. I’d certainly be content to drink two pints of Punk IPA than three pints of much of what is sold in Leicester. The whole “we’re so anarchic” schtick of Brewdog can sometimes get a bit wearisome but there is no denying they make compelling beer. 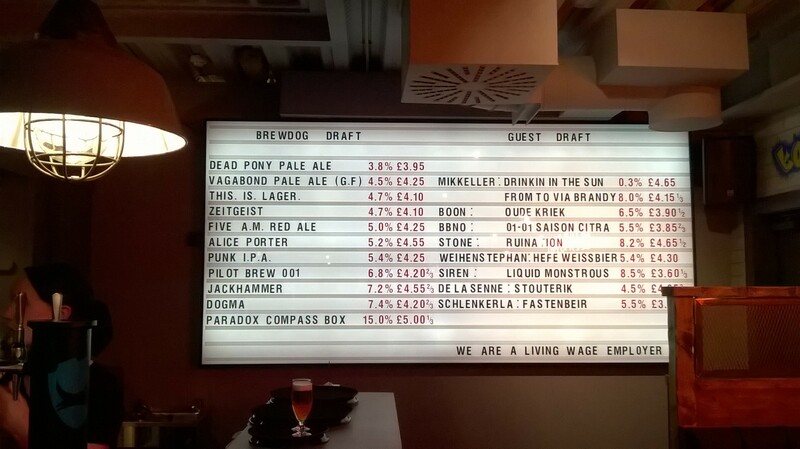 What’s more, having criticised Bill’s for the practice of using tips to make up their staff’s hourly rate, I say well done to Brewdog for paying the Living Wage. Finally Co-founder James Watt – or his press person at least – knows how to get on the right side of us; “Leicester is a vibrant, cosmopolitan city and we’re thrilled to be finally setting up a BrewDog home there,” goes the press release. 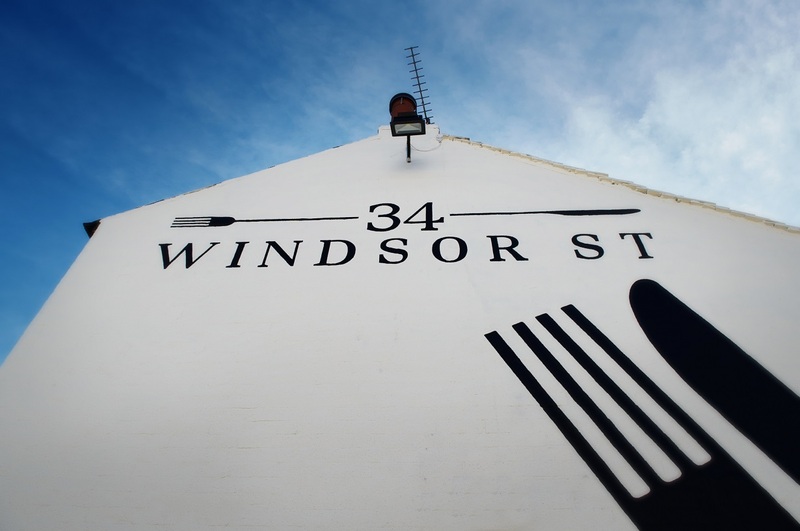 I was back at 34 Windsor St recently to review the work of new chef Arran Shaw. 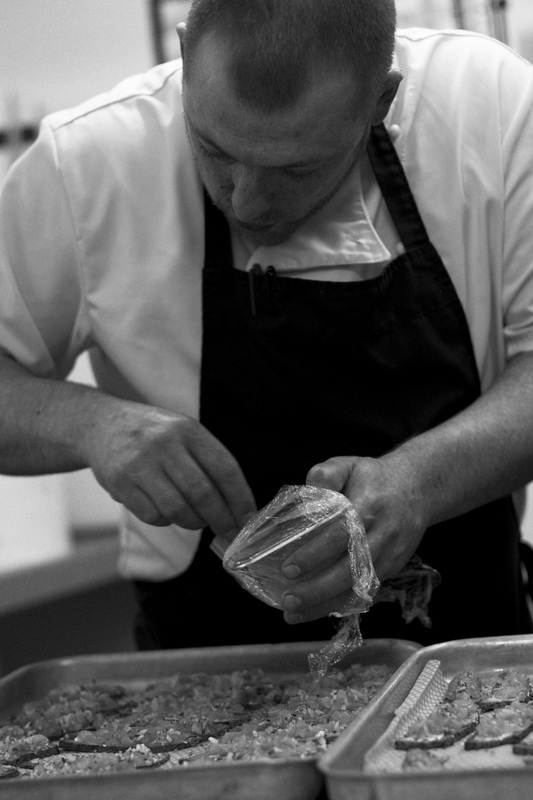 I’d recently interviewed Arran for Great Food Club and he struck me as passionate, serious -minded chef committed to offering adventurous and innovative food which remained a strong focus on customer satisfaction. For my starter a slow-cooked hen’s egg sat on a crunchy granola-type base, along with sweet sautéd wild mushrooms and a pillow of baked potato foam with “truffle aroma”. Enough there to go wrong but it was a delightful balance of flavours and textures and of cooking techniques. That said I wasn’t convinced about the texture of baked potato foam – it had the flavour but was a little on the gloopy side. Another starter of home cured salmon was a revelation – without a strong smoke or over-salting the flavour of the fish sang out merrily. Beer mustard and red and gold beetroot also delivered strongly but aside from the fish the main point of interest was a slice of remarkably complex Russian black bread. 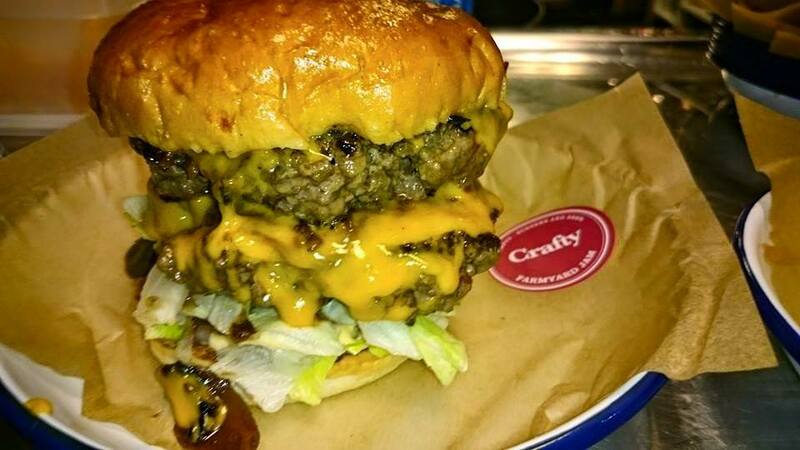 Apparently it has taken several years to perfect this, time well spent because the flavours came rushing out of it. Lamb with rhubarb was another successful combination, giving an intriguing sharp contrast to the super-sweet lamb rump. The slight bitter notes from the cooked slivers of cucumber added a further layer of complexity. The traditional rosemary flavour was introduced through herby mash. I was further pleased the lamb had not been trimmed within an inch of its life – the fat helped deliver flavour and succulence. Welsh sea bass fillets were perfect, with crunchy little potato rosti and a mild, smooth and creamy garlic and plum tomato sauce. Desserts were complex, multi-layered collections but everything felt right. Maple roasted pineapple was inspired and the rich, crumbly coconut sponge with it was a great match. I didn’t get a great deal out the banana and malt ice-cream but the dish worked well and was a great match with the exotic fruit flavours of a glass of Muscat de Rivesaltes. A tasting of chocolate featured a rich nutty, brownie, dark and white chocolate ganaches, a coffee and cardamom ice-cream and chocolate soil – with a curve-ball delivered by a splash of tarragon oil. It all might sound over the top but was a delicate and well-balanced affair. Dinner was served with good humour by very well-briefed and efficient staff in a smart environment, with even the crockery gaining appreciative comments from my artist guest. With rewarding food like this, 34 Windsor should definitely be on the map for serious diners from all over the county, as well as those poor souls over on the wrong side of the A5.